Democrats knew they were in trouble on election night when a Virginia Senate seat that was expected to be a blowout victory began to come in much closer than expected. “When you’re cheering for an eke-out win in Virginia, not going to be a good night,” one Democratic strategist told Business Insider. Another Democratic insider summed up their impression of the evening’s results in a rather blunt text. In almost every sense, the midterm elections were a disaster for the Democratic Party. They lost their majority in the US Senate, and the final results were shaping up to be close to the worst-case scenario for Democrats in which Republicans would swing eight or nine seats. In addition to the Senate majority, Democrats were badly beaten further down the ballot. They lost key gubernatorial battles — some in strongholds and others in key targets for pickups. And they were further walloped in the House of Representatives, where Republicans are now on track to have the party’s largest majority since 1928 for the final two years of President Barack Obama’s term. “Feel like we’re surfing at the moment,” one Republican official told Business Insider, playing off the theme of a GOP “wave” election. Democrats who spoke to us also described the results in nautical terms, but they saw it as a natural disaster rather than a day at the beach. 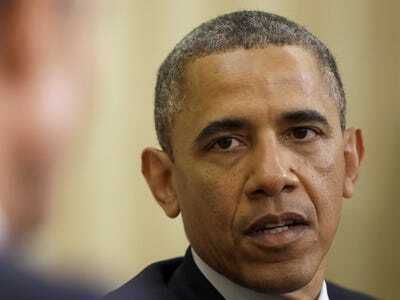 “No one expected the tsunami in 2004,” a Democratic operative said. The Democratic insider who described election night as a “bloodbath” also used the tidal wave metaphor — and they laid blame for the wipeout squarely at Obama’s feet. A national Democratic operative from the liberal wing of the party echoed the idea Obama was personally to blame for the party’s losses Tuesday night. They also slammed any of their colleagues who might try to defend the president. The operative also said Obama and Senate Majority Leader Harry Reid hurt the party by delaying ambitious action on immigration and other hot-button issues to protect incumbent senators in southern states. On election night, Democrats’ Senate problems began in Virginia, where incumbent Democratic Sen. Mark Warner was staving off a much stronger than expected challenge from Republican Ed Gillespie. Most outlets still had not called the race by night’s end, though Warner had jumped to a few-thousand vote lead in the race. “Didn’t expect this,” one Democratic strategist texted Business Insider as the race remained tight as the night went on. In the Senate battle, Democrats lost seats to Republicans in North Carolina, West Virginia, Montana, South Dakota, Arkansas, Iowa, and Colorado — giving the party a 52-45 majority. The results yet to be called include Alaska and Louisiana, where a runoff will be held next month and polls show Republicans are favoured to make another pickup. But perhaps more sobering for Democratic officials were gubernatorial races. Their candidates lost in toss-up states like Kansas, Michigan, Wisconsin, Maine, and Florida, all of which had highly vulnerable Republican incumbents. The GOP also took control of the state houses in the Democratic strongholds of Illinois and Massachusetts. 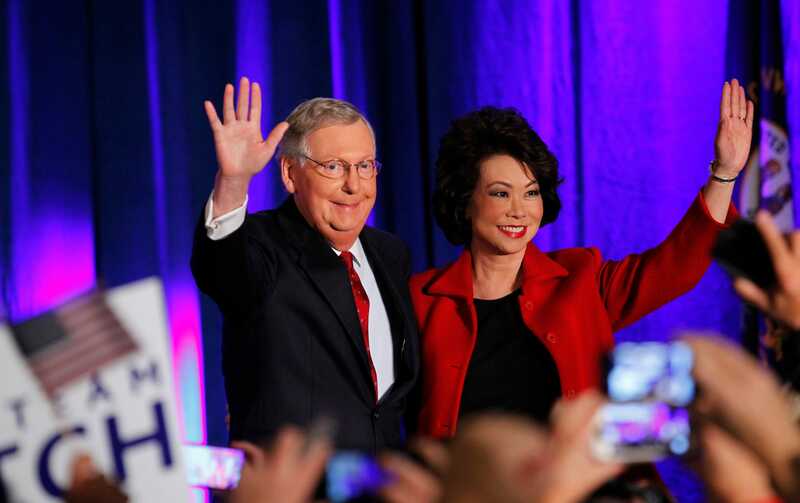 REUTERSMitch McConnell waves to supporters with his wife Elaine Chao at his midterm election night rally. However, the most surprising gubernatorial race of the night belonged to Maryland, where Republican Larry Hogan shocked the current Democratic Lt. Gov. Anthony Brown, who was sitting Gov. Martin O’Malley’s hand-picked successor. “We heard it was getting close but it ended up pretty much being a blowout,” a top Democratic official told Business Insider. One Republican strategist immediately pointed to Maryland when asked by Business Insider what they found most shocking about Tuesday night’s results. “What the heck?? It’s effin’ Maryland!” the strategist said. Indeed, the Democratic insider said Brown’s internal polling showed him up by thirteen points as recently as two weeks ago. “Voters tonight rejected the Martin O’Malley/Anthony Brown high-tax agenda and voted for real change with Larry Hogan,” Thompson said. Another Republican strategist pointed to Iowa as the most embarrassing loss of the night for Democrats. In that state, Republican Joni Ernst beat Democratic Rep. Bruce Braley to flip an open Senate seat into GOP hands. Along with Ernst’s victory, the GOP dealt an extra blow to Iowa Democrats by winning Braley’s seat in the House of Representatives. In that race, Rod Blum beat Democrat Pat Murphy. “Bruce Braley was such a terrible candidate that he even cost his party a safe House seat,” the GOP official said.